This is a common conversation among collectors at all levels of the spectrum. The rhetorical question becomes, what's the better investment, modern or vintage? There's not a quick answer for this question because it requires a more in-depth explanation to pose stances for a variety of points. In this article, we discuss both sides and let you decide where you think your money is best invested. Disclaimer: This article isn't positioned as advice on sound investment decisions; it's simply information about market activity. Dialogue around what I believe has strong investment potential is just based on my own market observations. How you decide to invest is entirely up to you. As with any investment, there are no guarantees. Under no circumstance shall I be held liable or responsible for any loss or damages associated with any investment decision of any kind. Inform yourself and invest at your own risk. Considered by many to be anything released pre-1975 but this category is growing up with each passing year. For example, over the past few years, I've heard some collectors define this category as anything released pre-1980. I suppose this is a normal trajectory given that one day stuff released in today's market will fall into the Vintage category. For this conversation, however, the Vintage category will be anything pre-1975. Because cards were put into such damaging situations back then, many of them didn't survive and a good majority of those that did made it out with several broken limbs. If you were one of the lucky ones, you made it out without broken limbs but skinned knees were common. Only the ultra lucky never saw much life and hence were kept hidden away from all of the nonsense and survived untouched. These are mythically rare circumstances and it's because of this that high grade cards from this era are extraordinarily rare and equally as valuable. This brings us to the conversation of collectability. Given the dire circumstances commonly associated with life events of vintage cards, high grade copies hold significant value and continue to appreciate with time. If you need proof of the validity of that claim, just look at any previous price guide ever published and compare it with a recent one. Or better yet, track eBay Completed Sold Listings and you'll see steady growth associated with high grade vintage values. This is only going to continue with time. Granted, if we're talking population reports for graded examples, those will rise too, which in turn will impact final values. But I don't believe this will have enough impact to make much of a dent in the market in terms of the collectability of vintage cards, especially those in high grade. As more and more high grade examples are graded and sold into permanent collections, the prices will continue to gradually rise. Had I known a PSA 9 example of the famous 1968 Topps Nolan Ryan rookie card could be had for a few thousand dollars back in 2008, I would have tried to get one. Today, that same example fetches north of $30,000 and the value just keeps climbing. This trend will continue especially for notable vintage keys. So what in the vintage era will hold value and collectability? In my opinion, all of it. With short print runs, the rarity of mint examples, set collectors, registry collectors, deep pocket investors, and big time auction houses listing some of the most amazing pieces the hobby has to offer (most of which were released in the vintage era), cards from this era have exceptional long term investment potential with continuous appreciation. The modern category is a bit more complex and comes with a different set of influences. Its collectability is varied but can be quite desirable depending on the card. For this conversation, we'll define modern as anything printed from 1975 forward. Granted, when I think of modern, I think of anything from 1991 forward with most of the focus on stuff produced in the last 15 years or so. There's a lot of good stuff that can be had from this bracket of time. The first Beckett Monthly publication for baseball card prices was released in November of 1984. As soon as that issue came out, collectors and non-collectors alike surged the market for cards. Since there was now documented proof that stuff had monetary value, sales for sports cards skyrocketed. As such, manufacturers had to keep the printing presses on day and night for an entire year to meet the ultra high demand. People expected now to buy lots of cards to one day sell so they can send their kids to Oxford. Little did they know that the very nature of the existence of a price guide would create an economically volatile marketplace and values would eventually be worthless for a good portion of stuff printed during what is now known as the Junk Wax Era (1986-1993). When a consumer buys more and more of something, the degree of satisfaction associated with the acquisition of each additional unit of that particular thing decreases. What this means is that over time, especially in cases where there is a surplus of the item, consumer loyalty may be compromised and manufacturing profits may decrease. In the case of non-collector investors during the peak years of the Junk Wax Era, we experienced a huge influx of buyers. This market had little to no chance of sustaining over the long term because they would soon realize that oversaturation would lead to minimal investment return if any at all. So what did they do? They stopped buying. When customers stop buying and there's a surplus of inventory still left in the market, it destroys investment potential. When a market is filled with products nobody wants because the value isn't there due to manufacture saturation, this can be a catalyst for lack of consumer interest and ultimately category destruction. Luckily, companies like Upper Deck and Leaf created design and quality innovations that would spark a much needed boost in consumer interest that allowed the market to survive. While saturation occurred in the 1980s with regard to print yield, it continues today but in different forms. The following is a breakdown of each decade of the modern era and its associated most popular cards. While things were the same as they were in prior years with Topps still monopolizing the market, it was a good five-year block. These cards still hold value with high grades continuing to gain momentum and overall collectability. The 1980s - New competitors and holy print runs, Batman! Even though print runs were huge, high grade examples of any of these cards have continued to appreciate in value. Raw copies, however, can still be had for affordable prices. The 2000s - Enter the relic cards; all the relic cards you can handle... and more! To be fair, the first relic cards were found in 1997 Leaf Thomas Collection and 1997 Upper Deck Game Jerseys - cards in either of these sets are exceptionally rare and incredibly valuable and collectable. To many collectors, these are untouchable. 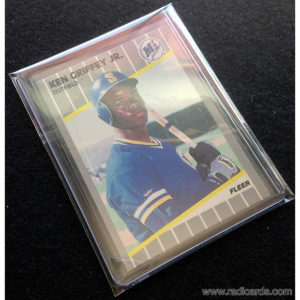 For the remainder of the '90s, relic cards could be found in more releases, each with ultra scarce insertion ratios. During this time, relic cards featured superstar talent almost exclusively. When you found one, you knew it was gonna be a big card of a big player. Finding relic cards from the '90s still remains a pretty big deal with value and collectability continuing to rise almost regardless or player. By the 2000s this trend blew up and countless relic cards could be found in nearly every product. Over the decade, less emphasis was placed on player quality so the act of pulling a relic card became passé and in some cases annoying. Things have gotten so bad in this category that relic cards are now going unsold in $1 bins at shops and shows across the nation. As far as value and collectability goes, even with top talent, it's rare to find a relic card that many collectors care much about much less add to their Most Wanted checklists. Sometimes you can't even give this stuff away. Yuck! Since by this decade, the hobby had just about had it with relic cards, the market needed a new direction. 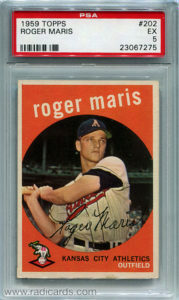 To save money, manufacturers produced cards with sticker autos. They would also buy back old singles to have signed by the player and to be re-released into the market with an autograph and low print run, which has become another trend in and of itself. Nearly everything seems to be serial numbered. Each of these trends has been completely overproduced. Again, player quality is no longer the focus, which some might argue is a problem. The so-called "Guaranteed Hits" in the form of signed cards, relic cards, printing plates, and buybacks could be of players that will never reach the majors. And around we go with more fodder for the $1 box. As far as value and collectability goes. Value can range but long-term investment potential is slim to nonexistent, which means collectability is minimal. Granted, there are exceptions, or statistical outliers so to speak but these are few and far between. Sure, someone could pull a Ruth or Mantle cut signature out of a box of Legendary Cuts but these are exceedingly rare instances and in a lot of ways may or may not count depending on how you look at it. I say this because these players have already proven themselves as some of the best guys to have ever played the game. In that way, there will always be a market for their cards. This is certainly much more of a promise than the long term value and collectability of guys like Phil Nevin, Darren Dreifort, and Morgan Ensberg. One trend continues to dominate every decade, the rookie card. There has always been interest in rookie cards no matter the era. Thing is, up to 1980 a player generally had just one rookie card i.e., Rickey Henderson. One and done. These days, a player can have easily more than 50 different rookie cards i.e., Albert Pujols, Bryce Harper, Mike Trout, and Kris Bryant. If a player has countless different rookie cards, it can paralyze consumer choice. Too many options can be demotivating. It can also lead to lack of enthusiasm for any one single example, which can lead to diminished seller returns and minimal collectability. Sure, there are lots of rare low serial numbered parallels of player rookie era cards but with so many options, selecting the one to buy can be difficult. Base cards will generally have little value while cards with ultra low print runs may be out of reach financially for a lot of collectors. Which one is right for the collector depends on the collector's purchasing power and product availability at the time of purchase. Generally speaking, the rarer, the better. Which one is the player's true rookie card? This has also become an issue in the modern era. Discussed in a previous article, the term Rookie Card is defines as the first time a player is depicted on a card produced by a major brand licences by both the MLB and MLBPA (if we're talking baseball). When players show up in miscellaneous Topps and Bowman products years before they ever reach the majors (if they ever do at all), those cards are considered their true rookie cards. Now, some people might argue that these aren't technically rookie cards because the player hasn't yet played a professional game. These same folks might call these Prospect Cards. To help me better understand all of this I call first appearance cards, Rookie Cards and call the cards released when they finally reach the majors, Rookie Year Cards. Things are made worse when brands include the RC symbol on cards. In a way, it might make more sense just leave that logo off because it confuses the heck out of collectors and tricks them into overpaying for less collectible Rookie Era Cards no matter the condition. Caring for cards in the modern era. Since the onset of price guides, collectors have focused their attention on adequately preserving and caring for their collections. As a result, a good strong majority of what's released remains in Near Mint+ (NM+) condition. With the help of cases, binders, sleeves, slabs, and other forms of archival storage, cards are better kept than ever before. As such, lesser condition examples are rare. With print yield being higher than it was in the vintage era, product availability is abundant. What this has done, especially in the modern era, is allow collectors to have a lot more discretion as to which examples to add to their collections. Because stuff is generally found in NM+ condition, more focus is put on sub-conditions such as whether or not it's a parallel or low serial #, and if it has some form of added characteristic i.e., autograph or relic. Emphasis has been placed less on condition and more on added benefits. The result is that base cards are left to be sold in bulk lots or $0.25 bins. The one benefit here is that kids have tons of affordable options. What will retain value in the modern era? There has been a slow but steady increase in value of high grade cards from this era. 1982, 1985, and 1986 Topps have all experienced strong sales for key cards in high grades. Even with high production output for these early '80s Topps sets, quality control hadn't yet tightened its waistline so Gem Mint examples will continue to remain statistical rarities. Many collectors that couldn't afford to buy their favorite insert cards as youngsters are now in their 30s and with steady incomes, which allows them to finally enjoy the finer things. Due to extreme brand competition and continuous innovation to stay afloat, many of the rare cards from this era are just way the heck better looking than a lot of the stuff that came out after this decade. Incredible insertion ratios allows for significantly difficult finds for much of the high end stuff from this era. If everyone wants it but nobody has it, this can create the perfect storm on the exceedingly rare occurrence that the card finally does surface. This stuff continues to grow both in value and collectability. As time goes on, more and more of this stuff will end up in permanent collections making it even more desirable, valuable, and collectable. Prior to Upper Deck losing many of its key licenses, there was once a time when it released cuts in several of its premier releases from the 2000s. There will always be a market for cut signatures featuring pre-war and vintage era guys such as Wagner, Ruth, Dimaggio, and Mantle. This is especially the case for HOF, Team, or Autograph collectors, of which makes up a good portion of the market. These markets aren't going anywhere. As we can see, the modern era is pretty complex but with a bit of research, one can make sound investment decisions. With so many options in the modern era, patience is favorable and hobby knowledge is integral. The collectability of an acquisition is as good as the degree of knowledge around the purchase itself. Learn as much as you can about something before you buy it. Have something to add? Share it in the comments section. With regards to the previous poster’s comments about 1990s cards, you are right that the 1990s were a time of oversaturation. But it is precisely because of this oversaturation that rare insert cards from that era are so iconic and memorable to many collectors. Rare insert cards from the 1990s are like the needle in the haystack. There is actually widespread agreement regarding some of the best inserts/parallels from the day (1993 Finest Refactors, 1998 Donruss Crusade, 1996 Select Certified Mirror Gold, etc.). I see these cards as retaining value in the long run. Good point on the first “MLB” year. Changes have been made to the article to reflect this. Thanks for reading and commenting. My personal favorite 1990 card is the Jordan #26 Fleer. Unfortunately their are thousands, and thousands of the cards in circulation probably 10’s of thousands! There are millions and millions of that card in circulation.